When a Caricaturist illustrates a person, they capture the essence of their subject and highlight each individual’s unique features. These professional drawings are drawn in a fun and exciting way that will have your guests guessing at what the illustrations look like when finished! All Caricaturists have been trained to finish each sketch quickly and accurately, so this way everyone interested at your event can have a turn! You can request the talented artist to draw you on your own, or alternatively, you can request they sketch you with a loved one or a group of friends. Find a Caricaturist for hire near you in minutes! Option 1. Enter your event location below & contact a Caricaturist directly! Option 2. Request multiple quotes from available Caricaturists Get Quotes! Option 3. Read information & advice on hiring Caricaturists Read Advice! Caricaturists are a great example of the growing interest in hiring artistic entertainers. Working at high speed, they can produce many portraits in a sitting, exaggerating facial features to great comic effect. Guests will be delighted with funny pictures of themselves and will go home with a treasured memento of your event. Portraits can be in black and white or colour, or you can hire a digital caricaturist who will use the latest iPad (or similar) equipment, allowing pictures to be emailed and shared on social media. Caricaturists take up little room, needing only a couple of chairs and a table, and they bring a whole lot of fun and laughter with their unique and highly personal sketches. They are perfect for birthday parties, fun days, weddings, award ceremonies and work celebrations. For more detailed information on booking a Caricaturist, including exactly what they will do at your event, cost and how to book, you can read our Complete Guide to Booking a Speciality Act. This contains all the information, tips and advice you need to help make your event one to remember! A Caricaturist makes a brilliant addition to your wedding breakfast, where they can sketch the bride and groom, or the whole main table, capturing all the fun and festive atmosphere of your meal, and even the speeches. At your drinks reception, they can sit in one location and draw guests one by one. Family and friends will love their portraits and will leave with a wonderful reminder of your special day and the activity will help break the ice for other guests. In the evening, you can have an artist set up in the main wedding hall. Whatever part of the day your Caricaturist attends, they will add joy and excitement to the day. A good caricaturist is not only a talented artist, but also a natural entertainer, knowing how to put people at ease while they’re being drawn and telling amusing stories to keep guests entertained. You can also hire a Caricaturist to create drawings from individual or group photographs or to create personalised wedding invitation. This is a great way to avoid the usual format and create a sense of fun ahead of your big day. Hiring a Caricaturist for a convention or product launch is a brilliant way to attract attention and create a buzz. People will be intrigued and be drawn to come and watch the sketches take shape, as well as wanting to have their own done. Portraits can be drawn on your company’s branded paper, giving customers a fun memento to take home that also displays your logo. You can expect Caricaturists to create much laughter at your birthday bash, office party or Christmas celebration, as colleagues, friends or family members show each other hilarious cartoon portraits of themselves. Even better, guests can take their caricatures home as a keepsake. You can even hire a contemporary Caricaturist who draws digital sketches that can be emailed, blown-up, printed and shared. Just imagine everyone’s life-like portraits being put up around the office the next day, or shared on social media for everyone to enjoy! 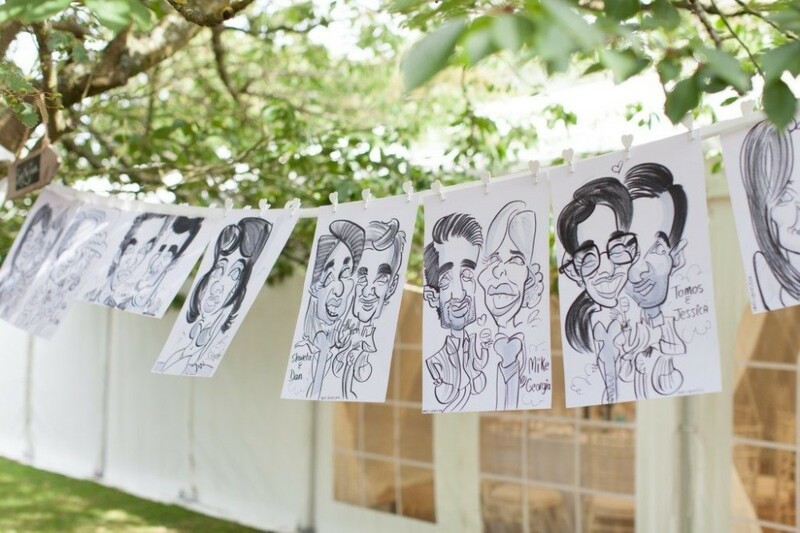 Each Caricaturist has their own distinctive drawing style, so you’ll want to take a look at a few artist profiles, to find one that suits your occasion. Using our simple search function, simply add your location and click search to see a huge variety of artists to choose from. Our latest testimonials are also a fantastic way to start getting some ideas for your shortlist. Once you’ve found your ideal act, just contact them direct! Even better, if you would rather entertainers came to you, you can request multiple quotes here, and this service is completely free! Booking a Caricaturist can make all the difference to your party, and we know we have exactly the right artist in our directory waiting to fill your event with fun and smiles. We hope you enjoy your search but do contact us if you need any help with your booking. WANT TO RECEIVE A RANGE OF QUOTES FROM Caricaturists?